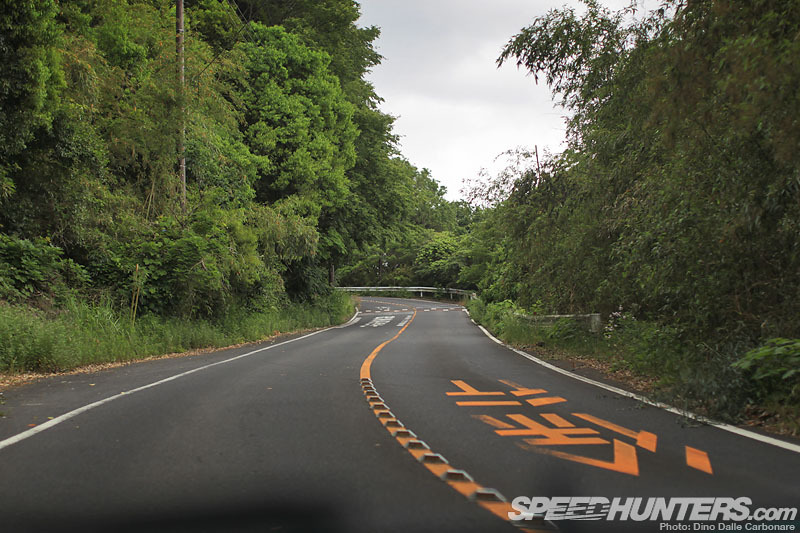 We love our drive features here at Speedhunters. 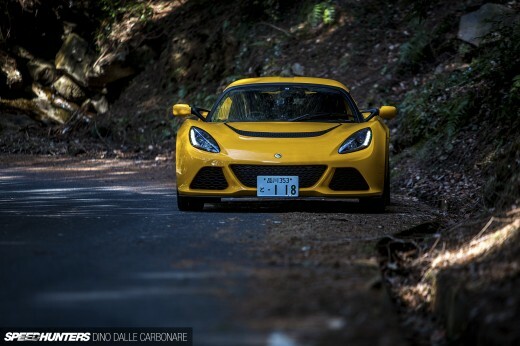 They’re at the core of what we stand for, combining our passion for cars, photography and driving in one fell swoop. 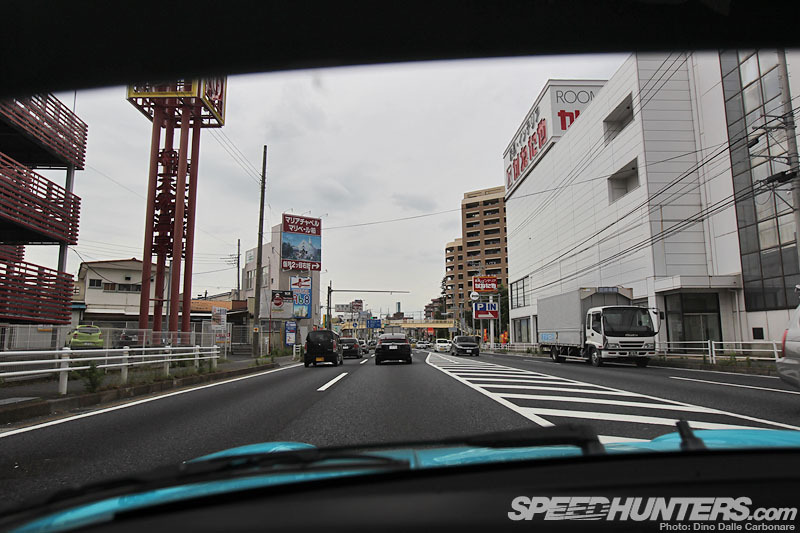 So it’s probably understandable why I was edging on sensory overload the other day, as I found myself behind the wheel of one of Nakai’s latest creations, on one of my favorite roads, with my Canon 1D sitting right next to me on the passenger seat. 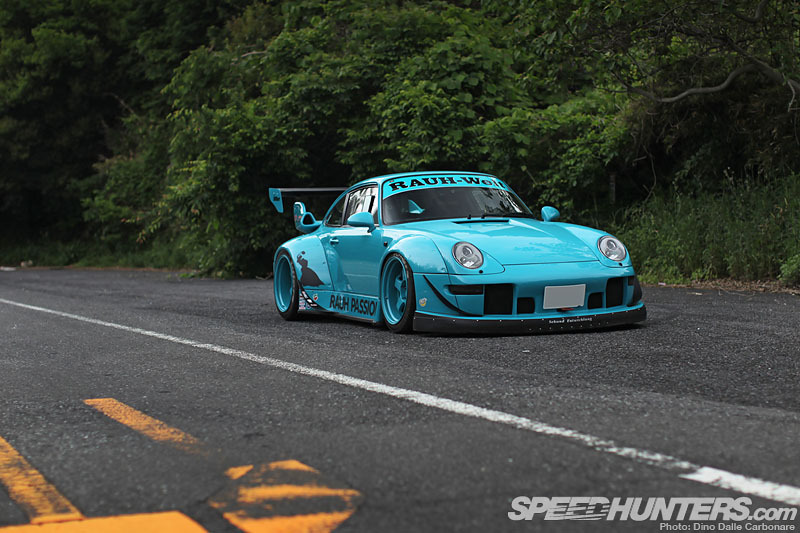 When I heard our VAG theme was coming up, I wanted to make sure I’d have something worthy to share with you all from my corner of the world, and naturally when Porsches are involved and you happen to find yourself in Japan, Rauh Welt is always the first name that pops in your mind. Plus, not having seen Nakai since the 12hr Idlers endurance race in Motegi last summer, this was one visit that was much overdue. So after a quick call to see if I could actually get away with asking to drive one of his creations for a dream drive story, I found myself in front of the RWB cave two days ago at 2pm. … we kept chitchat to a minimum, I moved most of my gear from the Pelican into my backpack and dumped everything in the frunk. … I was grinning like an idiot. 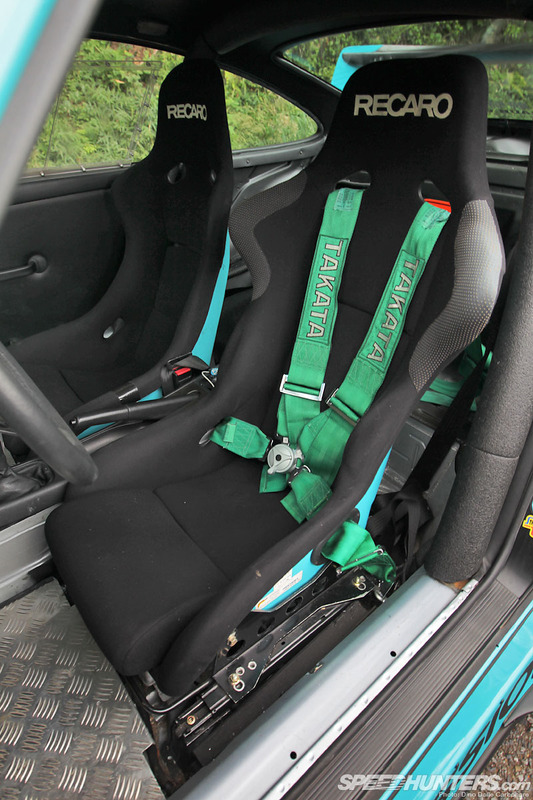 Despite the fact that my hips were being painfully squeezed by the vice-like bolsters of the Recaro, and the seat itself about 20 cm too far forward, I really didn’t care. I knew this was going to be one of the most memorable drives I will ever have, so I just concentrated on the positive things and let it all entertain me. … and stepped on the throttle. Now with this being a customer car, and a freshly repainted one at that, I had to handle it all with a bit of restraint, but with three deserted lanes of open road before me, well let’s just say I may have embraced the Rough World experience. I’ll let you interpret that as you will. 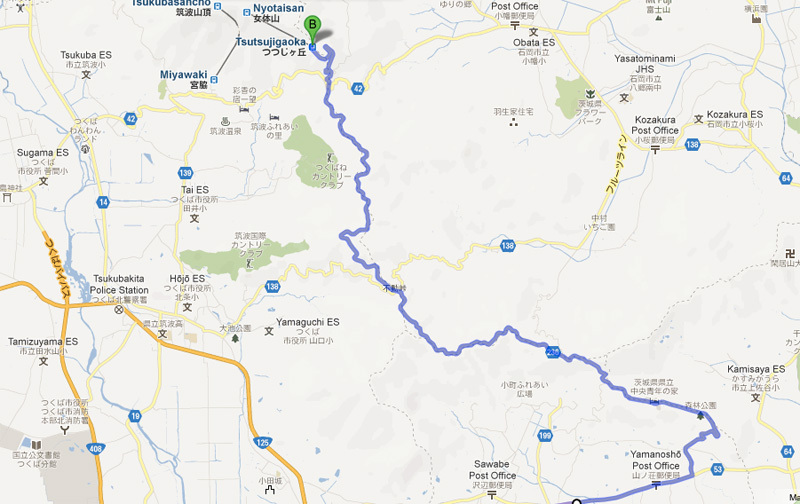 … and headed towards Mt. 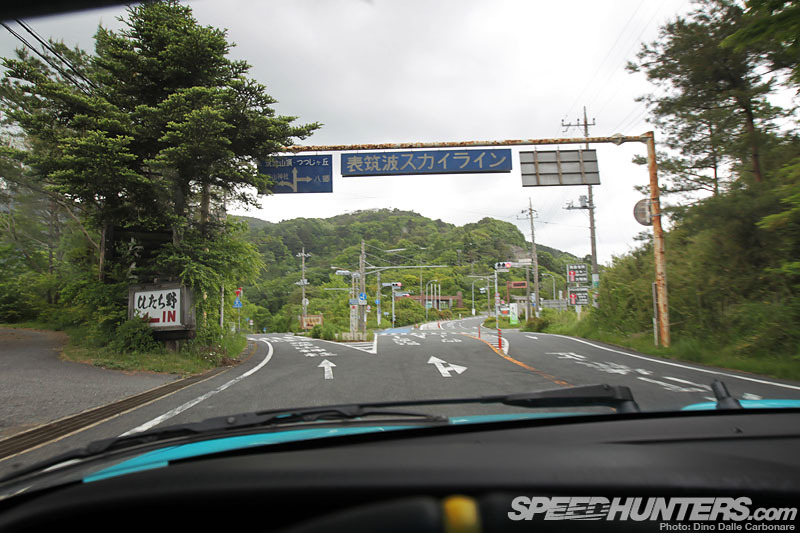 Tsukuba and more to the point the Purple Line, a long stretch of touge that snakes up the east side of the mountain. … I had to stop and get some initial shots. 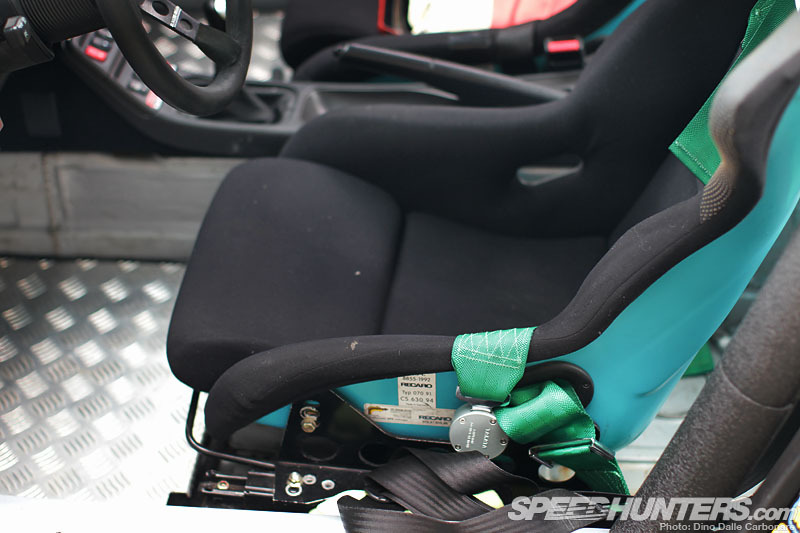 Actually the main reason I pulled to one side was to give my hips a breather, allow some actual blood to flow down to my feet and while doing so take a nice look at the car itself, something that in the rush of getting all ready and set up at the RWB garage, I hadn’t had a chance to do yet. … it looked great in silver before but now it’s on another level of coolness! As you can see here I was still getting used to the wide rear track: I pulled up on the side of the road lining up the front wheels to the white line but the rear wheels were almost out on the road itself! The cause of my pain! Even the seat backs have been color matched. 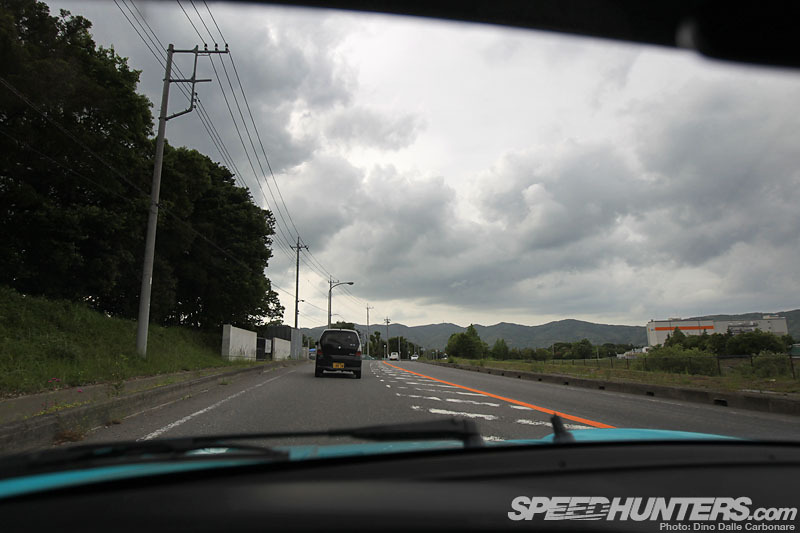 So with the car pointed right towards the summit of Mt. 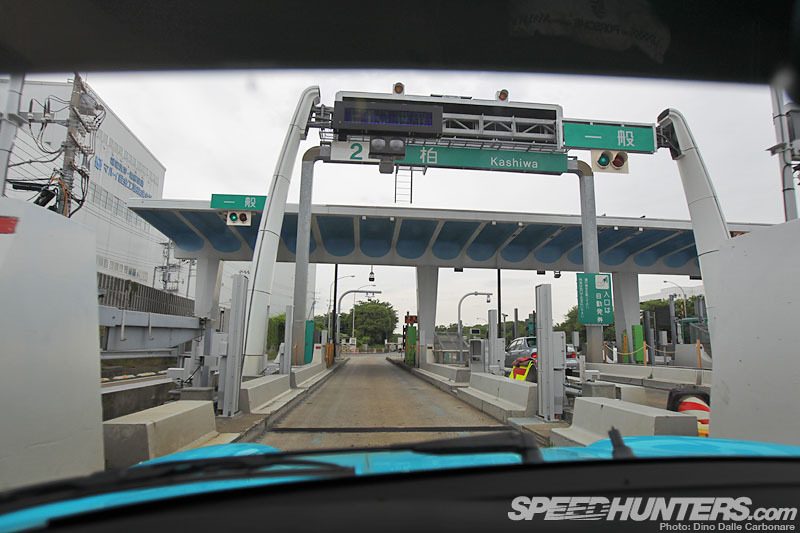 Tsukuba it was time to jump in again and get back to driving. 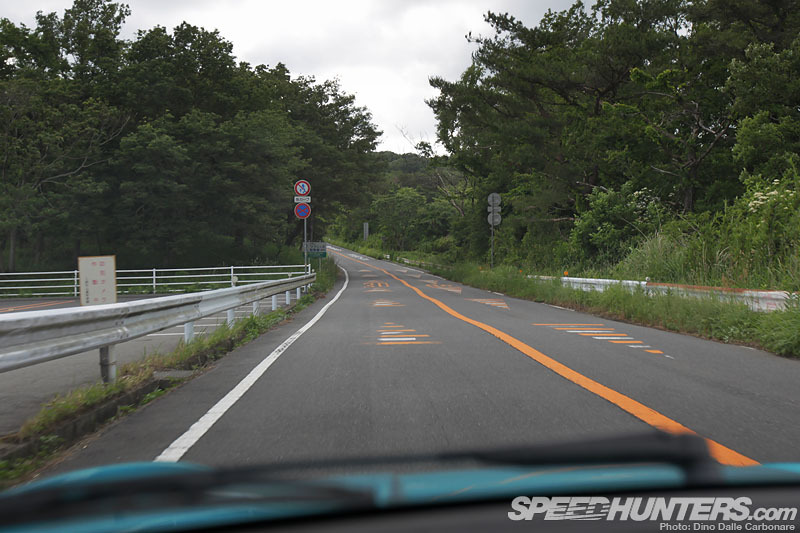 As you can see the Purple Line, which starts on the far right as you turn into it from Route 53, is the perfect choice of blacktop for one of our Dream Drives. … from then on, it’s all smooth tarmac. …to grab a few more pictures. 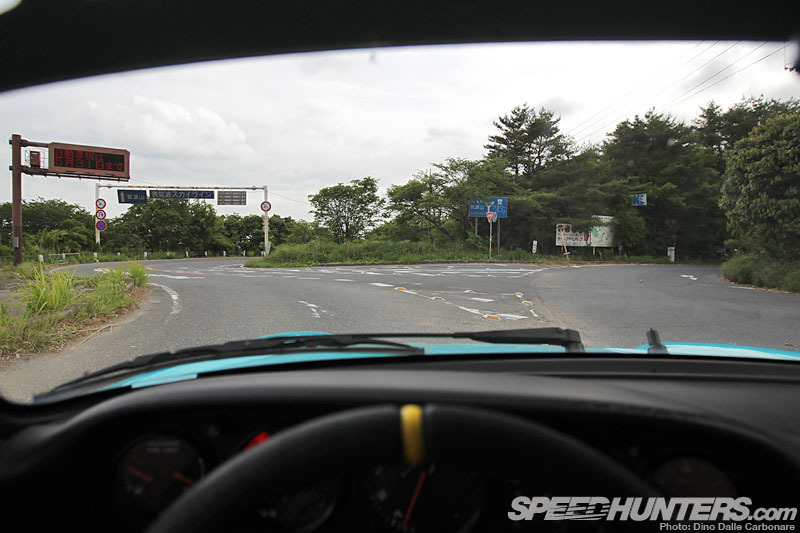 … and yep, you guessed it, I had to get in the driver’s seat once again and put those rear 335-section Kumho tires through a workout. … the racecar-like width of Nakai’s creations, not to mention the generous tire sizes, turns 911s into almost AWD-feeling grip monsters. I don’t think I’ve ever pushed an older 911 that hard before in total confidence. 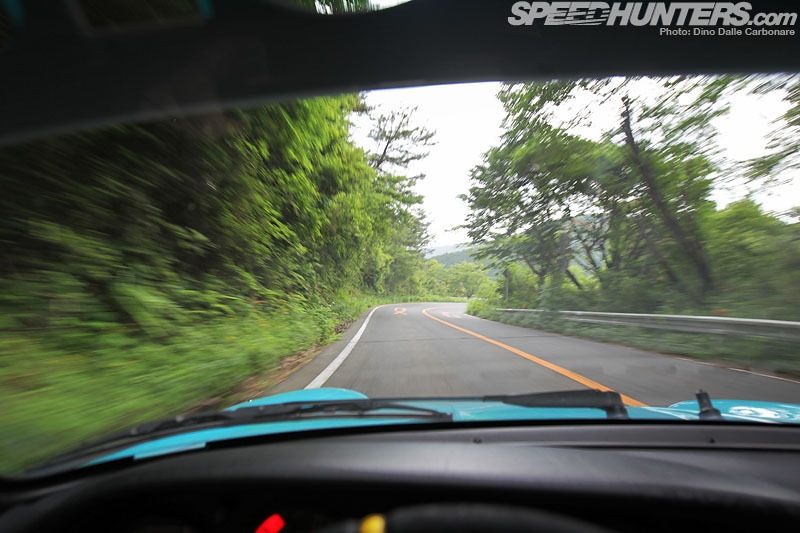 Overdo it and the RWB circuit suspension is set up for gentle and progressive understeer. 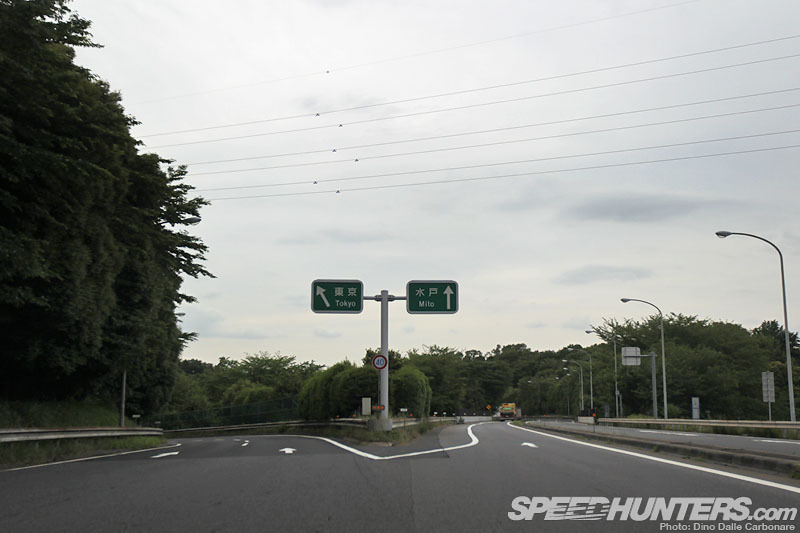 … I made a left turn onto the Omote Tsukuba Skyline, a road that crests the whole of Mt. 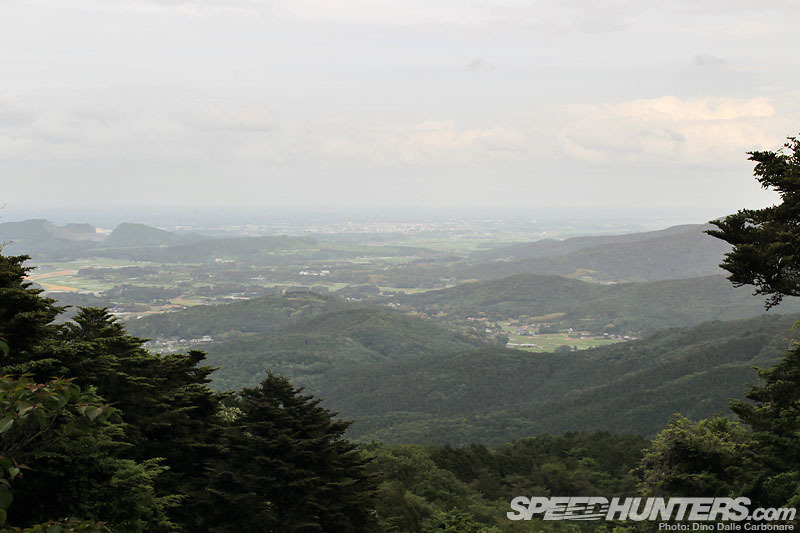 Tsukuba as it takes you right up to its very peak. 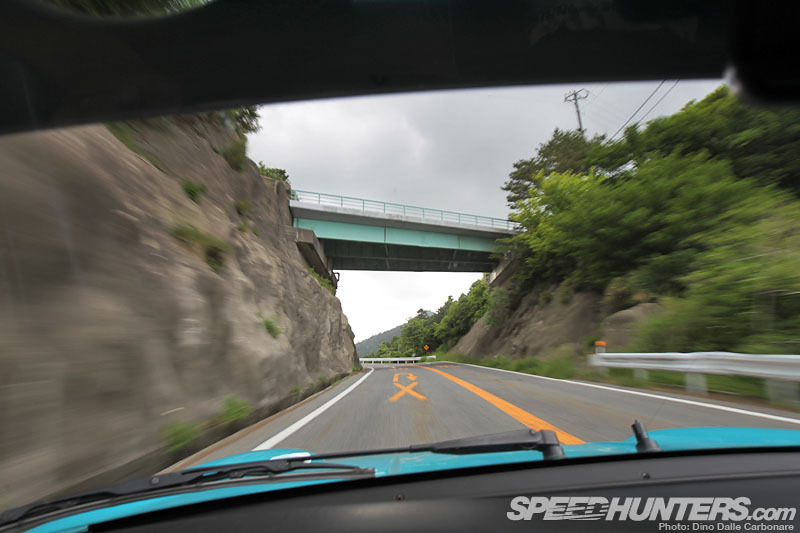 The road here is much better quality: smoother and newer surface, slightly wider and a lot faster. By this time the Rauh Passion had become an extension of my body, as I let it flow naturally, heel and toeing down to second for the corners and then using all of third gear on the straight. 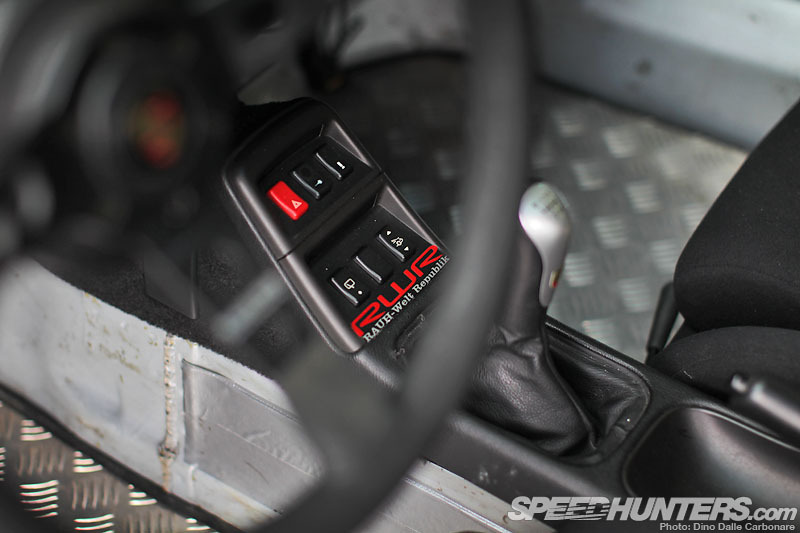 Every lift of the throttle generates a snappy backfire, adding even more pleasure to it all. 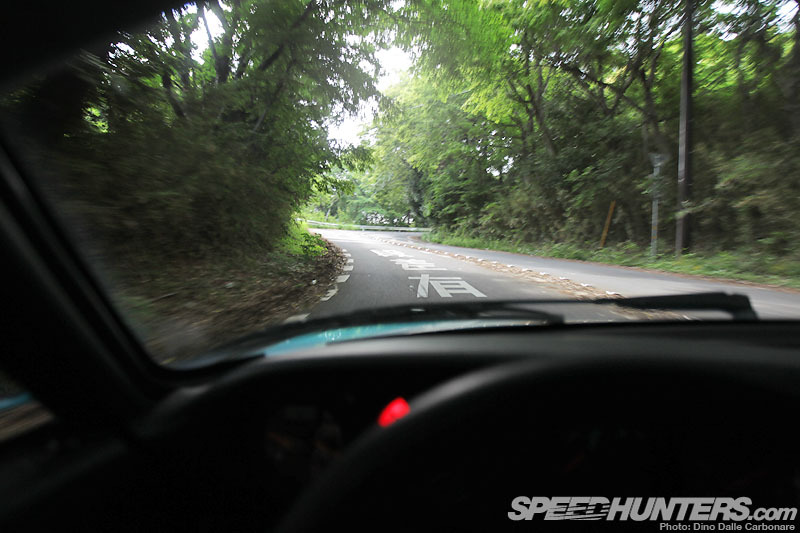 Sometimes I had to stomp on the brakes and slow right down for yet another JDM attempt at slowing people down, an outright dangerous one at that! 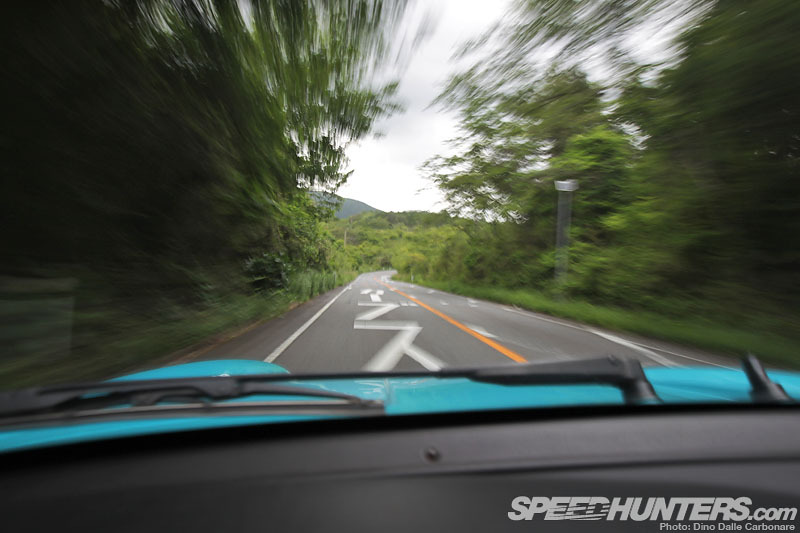 Take these series of undulations at speed and by the time you hit the last one your car is literally so unsettled that any snappy input of steering and brakes will probably result in a crash. 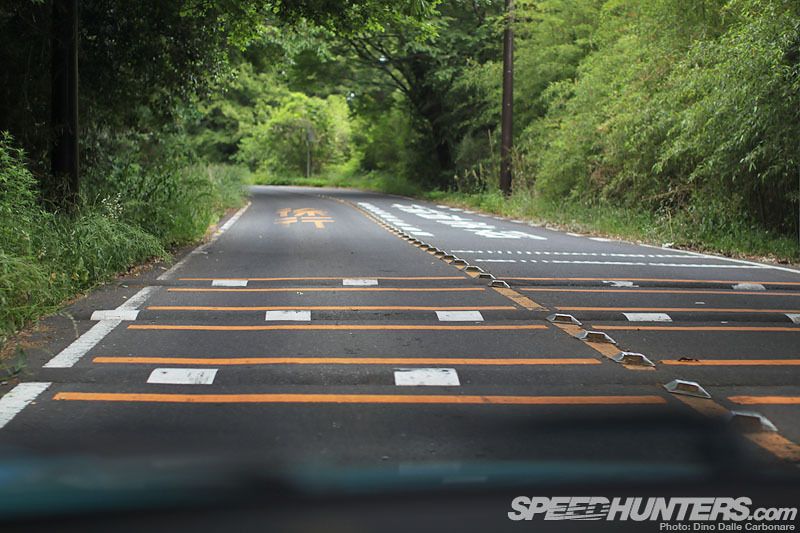 The Japanese don’t screw around; if they want to slow you down, they do it properly. 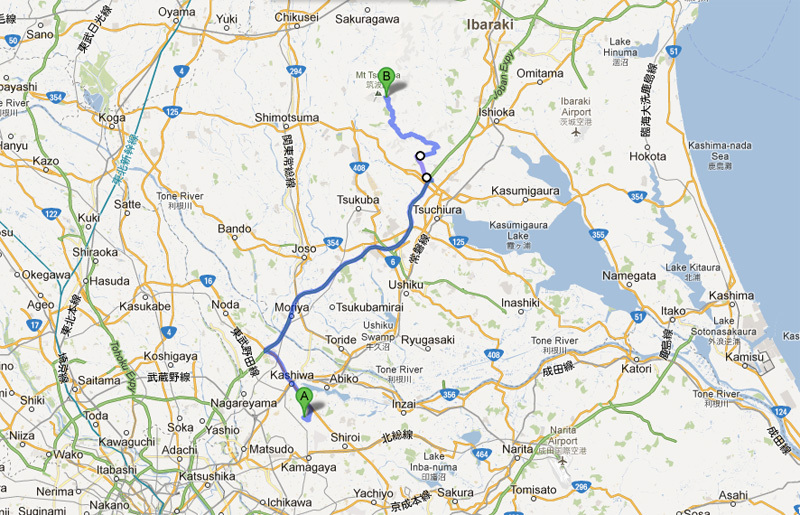 But once you learn where these three bumpy sections are, you can prepare yourself and go right back to proper driving. 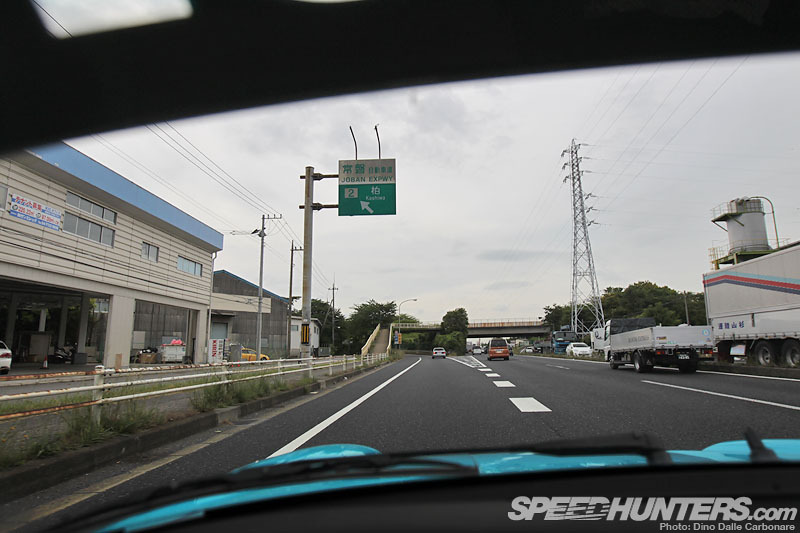 … stopping on the way down to get a shot of the 993 overlooking the Ibaraki-ken countryside below. … letting it cool off and giving me a chance to really look at it in detail. Now that’s what real men set their ride height to! 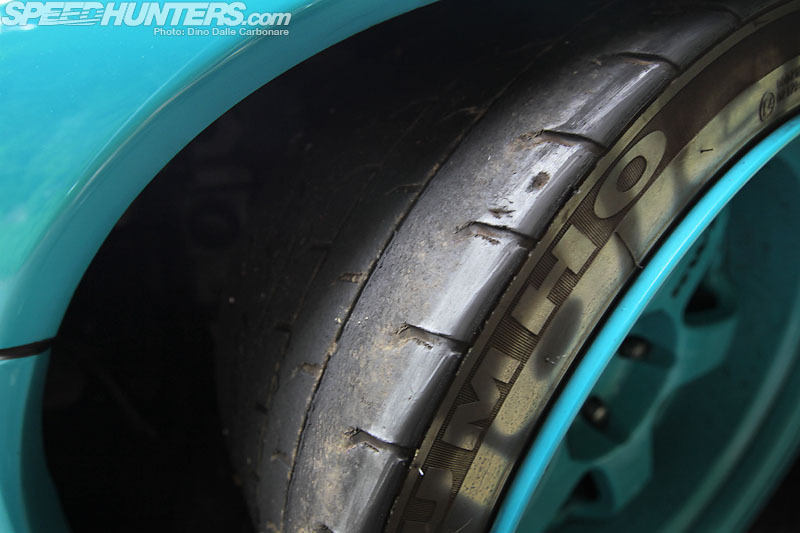 The Nakai-special screwed-on rubber lip is actually a nice solution to achieving an aggressive slammed look but allowing some extra space behind it. The rubber flexes back and forth as you tackle inclines or reverse down tough ramps, but never scratches, bends or breaks. It might look a bit rough after a while, but that’s the whole point. Plus, in the close to 300 km I drove the car that day, I never once bottomed out nor scraped with any side of the bodywork. 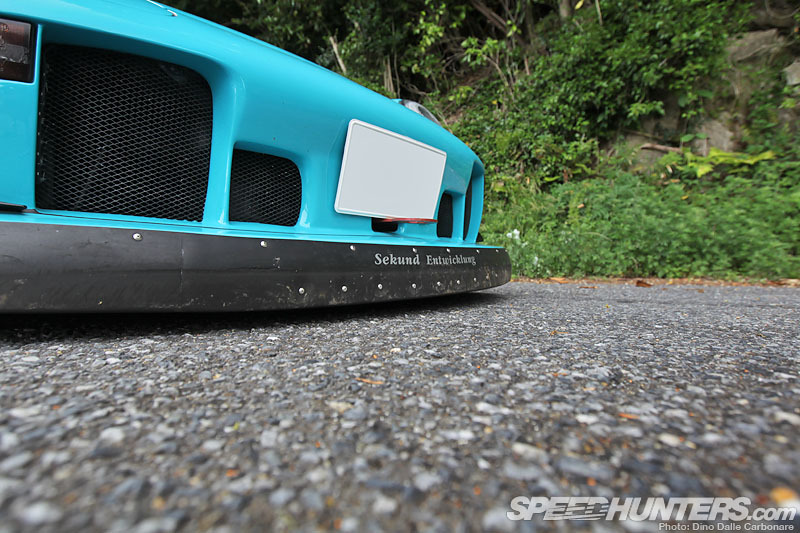 Nakai has obviously got it down to a tee now, creating cars that ride impossibly low, but are still easy to live with. I only really had some intermittent rubbing up front through the tighter corners, but the suspension is set so hard that the car hardly pitches or rolls. 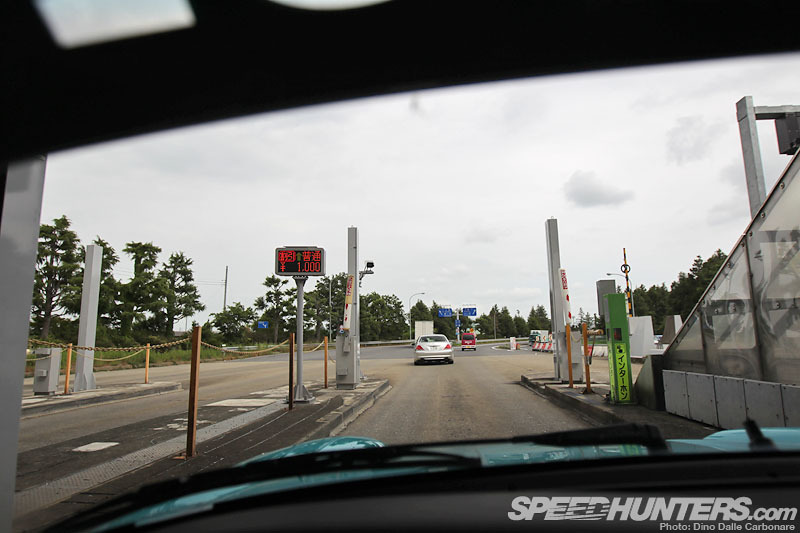 … under which hides the stock 993 3.6L flat-6. 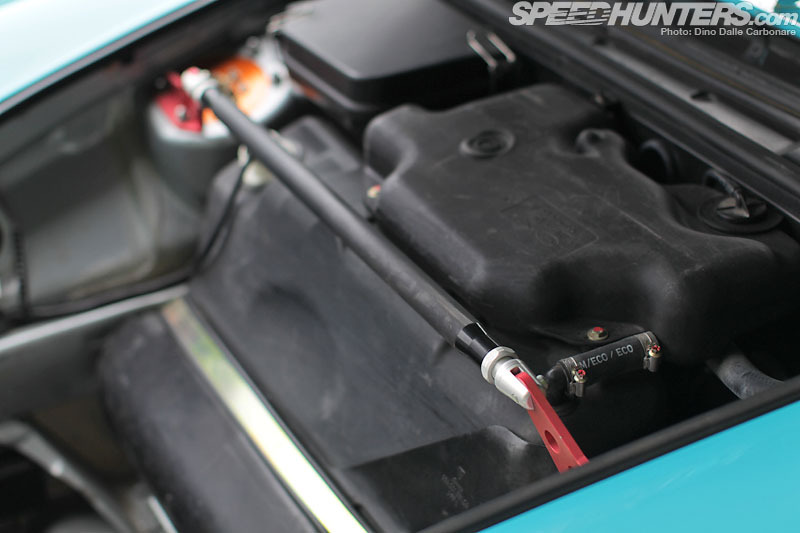 The ECU runs an RWB Tunerhaus chip to make full use of the performance exhaust – all good for about 300 PS. 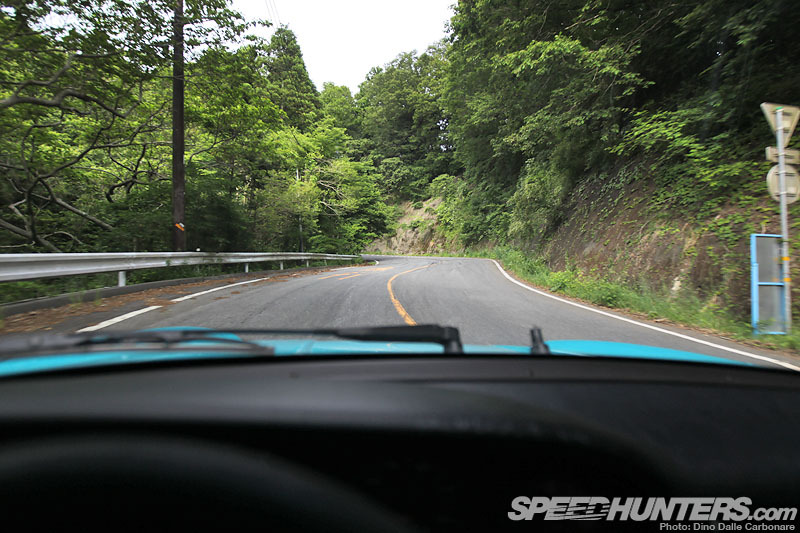 Might not sound like much, but it’s just right to have tons of fun on roads like I was on! 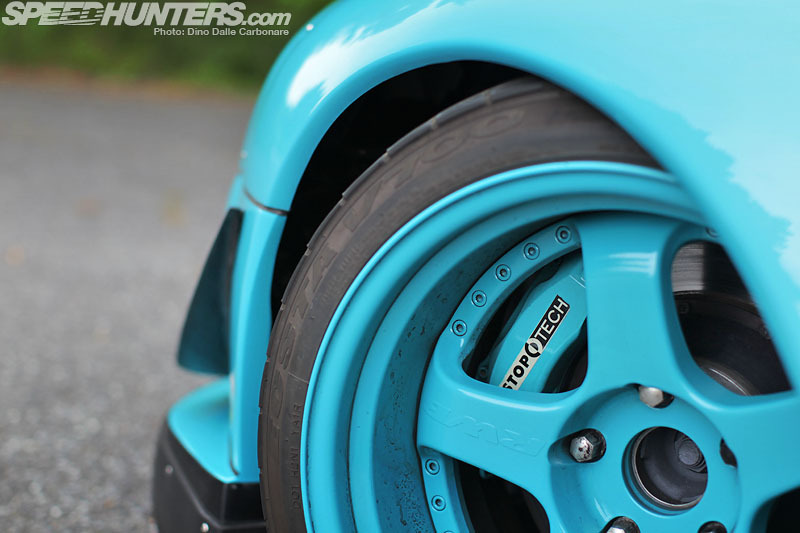 Big Stop Tech brakes have been fitted behind the RWB special SSR SP1s, now color-matched to the rest of the body. Any RWB car is of course all about the pumped fenders, screwed right onto the bodywork once Nakai has hacked away the stock fenders. 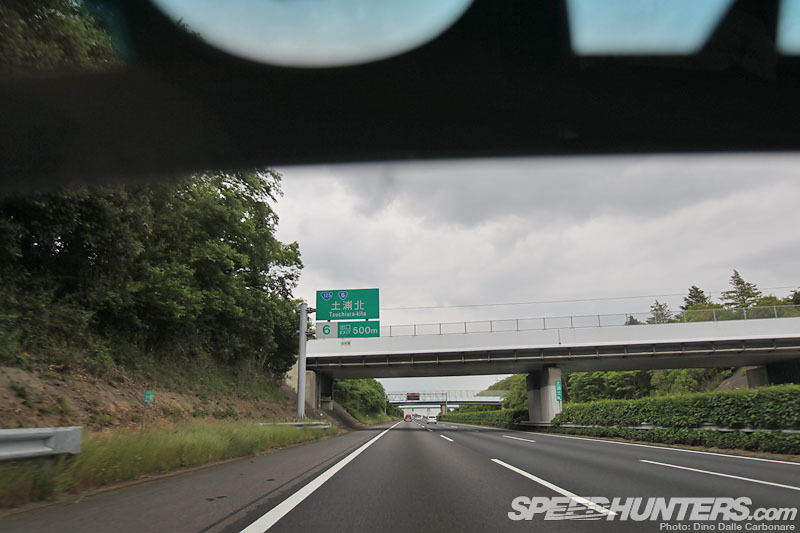 When the car is finished, the final touch is the name on the chunky side skirts; words chosen by Nakai as a reflection of the car, its owner or whatever he might feel like expressing on the day. The result is unlike anything out there! But as impossibly visual and oozing character as these cars are on the outside, what this drive taught me is that Nakai creates a superb balance between function and form, and to anyone out there who’s ever been lucky enough to experience one of these cars, then you know exactly what I am talking about. The focus is very much on the driving: discovering what the car is all about and making full use of the monumental grip available. 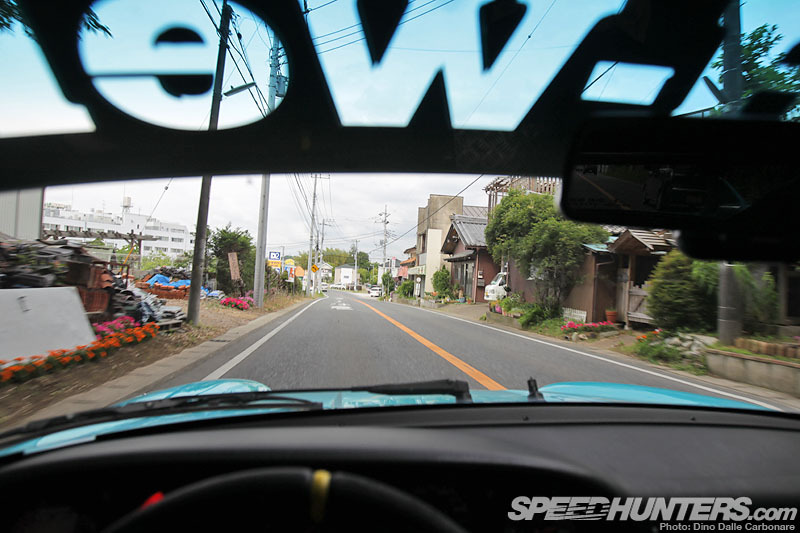 It’s not hard to understand why RWB has such a following and how dedicated owners are to their cars and the whole brotherhood that has developed across the globe. 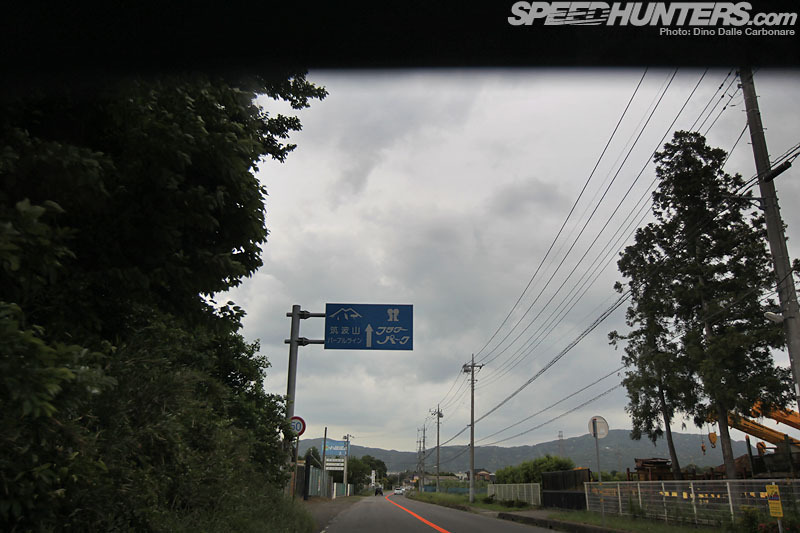 As the Recaro and Takata belts hint, these are cars that get driven often and hard; this Rauh Passion having been abused around Tsukuba many times by Nakai himself in its prior life as the Royal Montegobay and Tunerhaus. 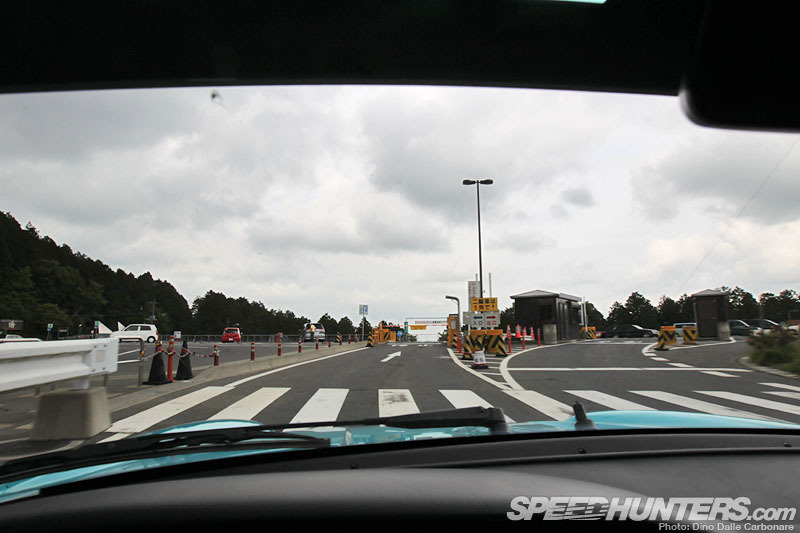 Many thanks to Nakai-san for allowing me to indulge in pure unadulterated RWB fun. no offense Dino, but those Recaros are not exactly designed for someone of your size.